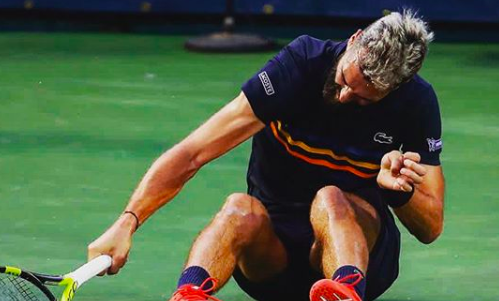 Benoit Paire meltdown at the Citi Open earlier this week has turned out to be costly for him, literally. The French tennis player lost his cool after going down 2-5 in the deciding set against Cypriot Marcos Baghdatis during their first-round match at the Citi Open in Washington on Tuesday. Paire was so frustrated that he straight away banged his racket multiple times before throwing it on to the court with all his power. Not that he was done with it. The 29-year-old kicked his chair away before picking up a brand new racket, only to vent his anger on it. He did it one more time while shaking hands with Baghdatis following the latter’s 6-3 3-6 6-2 victory. “Yes, yes it’s true I got upset yesterday,” he later wrote on Instagram. This is not the first time Paire has been in the news for the wrong reasons. He had been kicked out of the 2016 Olympics after failing to comply with various rules of French tennis. Time to get back to the old hairstyle, maybe? Au fait, oui oui c’est vrai je me suis énervé hier.. Ce que je retiens c est que je suis sur la bonne voie et que je progresse depuis le début de l’année donc pour ceux qui veulent rester sur ça il y a pas de problème mais moi je suis déjà passé à autre chose.. #next #Toronto Bravo Marcos pour hier et bonne chance ??????????????? ?